If you’re a creative person who has either dreamed of starting your own business, or has started your own business and wants to grow it without running yourself into the ground, the Lateral Action Creative Entrepreneur Roadmap is jam packed with experience, action and guidance to help you through. I signed up for the course when it was first launched in November 2009 and now there are rumblings that a bigger and better version of the course is about to be released. 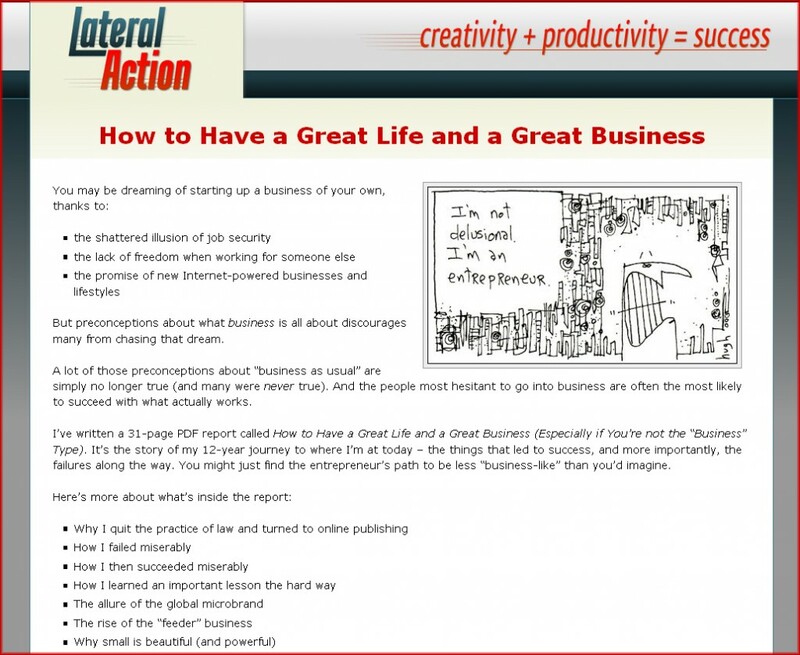 Lateral Action is a website that focuses on creativity AND productivity as a key for success. It’s run by Mark McGuinness who worked with Brian Clark and Tony Clark from Copyblogger to get it where it is today. Its articles help you realise the importance of creativity as an essential tool for economic survival whilst hammering home the point that creativity isn’t enough on its own, you’ve got to be taking focused action (rather than just being “busy”) to be successful. The productivity advice and techniques are specifically designed with creative people in mind. When I enrolled in the course it was made up of 6 modules featuring Mark, Brian tony Clark and also bonus content from Sonia Simone who specialises in marketing for people who hate marketing. In the first module, Brian and Mark show you how to figure out if what you’re thinking of doing is going to make you any money. They show you how to spot market trends, and how to position your business in a way that you don’t have to slave away trying to beat the competition all the time because your business will exist in a league of its own. This module is all about rolling up your sleeves, diving into the online communities to figure out who you can help, who can help you, and how you can emerge as a market leader by listening, collaborating and helping people out. It stops you creating a business in a bubble and builds strong foundations with your target market and possibly future business partners. Brian and Mark tell you that it’s okay not to please everyone, in fact, it’s kind of essential in making your creative business successful. They also show you how to best communicate your solution to people who you can help and turn them into customers who love what you do. For me, this is probably one of the most useful modules for creative entrepreneurs. The drudgery and details that keep a business going are exactly the kind of things that can kill it for a creative entrepreneur. Fortunately you don’t have to feel guilty if you’re no good at accounting or paperwork, you can develop systems to free up your time for the fun stuff: developing ideas and being creative and amazing. This is an exciting module because it looks at turning your business from a service or product machine into something that continues to generate revenue for work you’ve already done. This includes making sure you have a solid way to create an income from your business as well, making smarter deals with partners who can help expand your brand and by exploiting intellectual property for maximum effect. When I signed up, Mark and Brian also released Brian and Jon Morrow’s Partnering Profits Course as bonus content. If they include it again, I know people are going to snap this up. If you’re a creative person that doesn’t know how to start translating the brilliant ideas in your head into a business that’s going to make you money, Brian and Mark help you break it down into little steps based on their past experiences, and experiences of other creative entrepreneurs that they know. The worksheets help internalise the lessons and devise an action plan that is going to work for you. Brian and Mark have built their businesses by forming successful partnerships. If you’ve found it hard to crack the social scene of Twitter, or get onto the radar of entrepreneurs you admire, you’ll learn how to find like minded people and form relationships to make your business more profitable. The audio interviews are perfect if you want to listen to them on your morning run, on on your commute to work, and the transcripts are great if you’re a reader like me and like to study at your desk or in your favourite chair. This is not a course to be ticked off your to do list when you get to the last piece of content. It’s something that you’re going to keep referring to as your business evolves and it’s just as useful if you’ve already launched your business or are just in the planning stages. I’d been running Harrisonamy Copywriting for a year when I signed up and got out as much value from the beginning modules as the later ones. This course is crammed with content. It’s a whopper. Each module has three topics and each topic has its own audio, transcript, worksheet and bonus resources. Then there’s a ton of bonus content that you just can’t miss as well. If you’re the kind of person who has a ton of downloaded courses and ebooks on your desktop that you’ve yet to read, then this might just overwhelm you even more. But if you’re willing to put those other eBooks on the back burner and immerse yourself in this one course, you’re going to get a whole ton of value out of it that can transform your business. Interested in finding out more? Head on over to Lateral Action where you can download Mark’s Free Ebooks about Freedom Money and Time, and Marla’s Guide to Creative Entrepreneurship you can also get access to an interview with the amazing John T. Unger who has had incredible success creating and marketing his heavy duty sculptures.